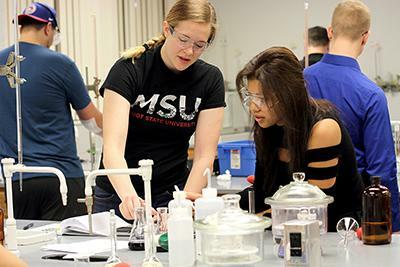 MINOT, N.D. – Minot State University will offer a third option in its chemistry major starting in the Spring 2019 semester focusing on extraction, purification, and analysis of compounds from plants. The option, called Medicinal Plant Chemistry, will enter the academic catalog in Fall 2019, but students can begin work within the chemistry department starting next semester. Medicinal Plant Chemistry joins Professional Chemistry and General Chemistry as a third option for the Bachelor of Arts degree. The unique chemistry option is the first of its kind in the state of North Dakota and the upper Midwest region, and just the second such program at a four-year university in the United States. While pursuing coursework in chemistry, biology, physics, and calculus and completing a capstone research project, students will earn over 600 hours of laboratory experience while focusing on the extraction, separation, and analysis of compounds and chemicals from plant material. Students will learn theory, skills, and techniques necessary to work in the medicinal cannabis, hops, botanical supplements, and food science industries. Hands-on laboratory experiences will prepare individuals for extraction, quality assurance, and quality control roles after graduation. According to Forbes magazine, the legal medicinal cannabis industry is projected to grow from $52 million in 2017 to $2.5 billion by 2027. As of September 2018, medicinal cannabis is legal in 31 states and D.C., and many states require the product to be used in its extracted form. Other botanical products, such as essential oils, are extracted using processes and techniques similar to those used for cannabis. As craft brewing continues to grow, many hops suppliers have discontinued doing analysis of outside samples in order to focus on internal demands. As brewmasters increasingly use hops extracts in their recipes, the market for workers skilled in extraction and analysis is expected to grow in this industry. Minot State chemistry students will develop practical skills during lab, class, and research by analyzing plant products using instruments that are common to the industry. For more information on Medicinal Plant Chemistry, please contact Heth at christopher.heth@minotstateu.edu, or find information about the chemistry program at MinotStateU.edu/chemistry.